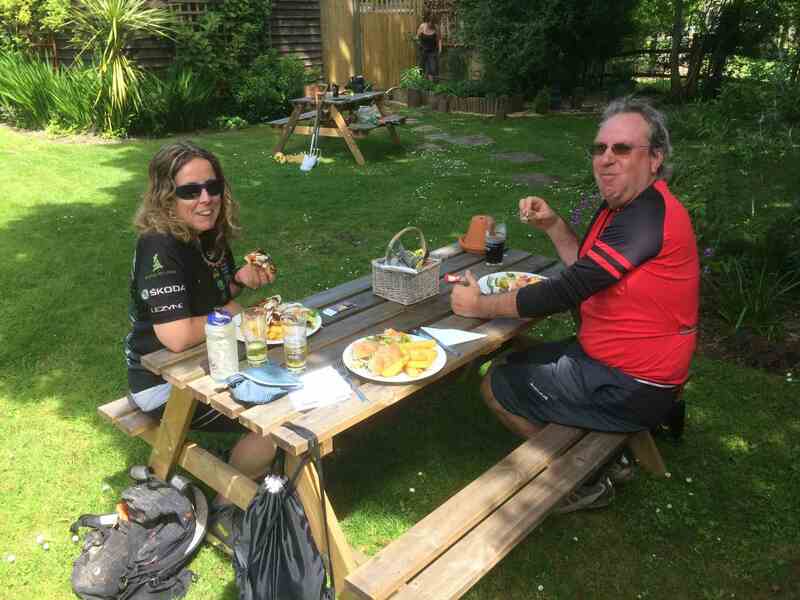 Part of the key ethos of the (leader of the) Monday Rides is to use unexplored byways and bridleways. 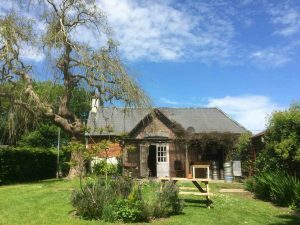 On the Downs, this is ideal – there is a close network of tracks generally pretty solid most of the year. But go further afield and this is not the case. Off-road tracks are discontinuous, albeit joined by quiet country roads, and believe it or not, much used by Horses. This results in winter use creating a pattern of deep hoof prints – up to 15 cms across and about as deep. This makes for interesting, exciting and hard riding. But many of the better tracks have a good surface and pass through gorgeous countryside. Our ride last Monday illustrated this. We left from Hellingly carpark adjacent to the Cuckoo Trail, and headed east by road to Magham Down. Here we found the first byway, Squirrel Lane. 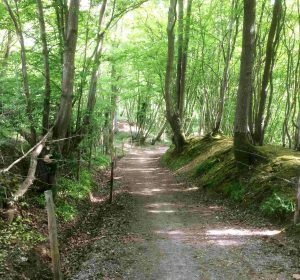 Well surfaced and undulating through woodland – really beautiful. Then we travelled by country road through Ginger’s Green, Stunts Green and Shreiks Lane to the next byway, Studdens Lane. 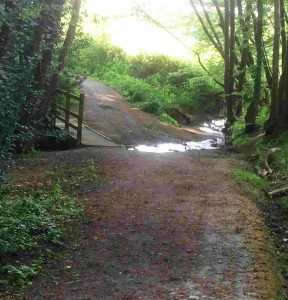 This proved more problematic with ruts and a small area of mud but it then changed into a lovely section through woodland and a bridge across a stream until we arrived at Treliloes (sounds like Cornwall). 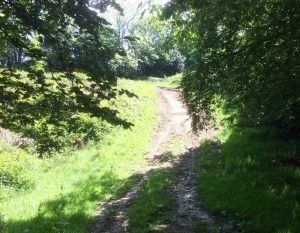 There was now 4 kms of hilly country lane to get to Churches Green where the next bridleway started. This was a different story and taxed our riders’ skills. 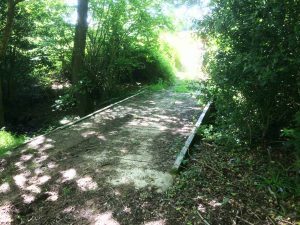 It was quite overgrown, along the edge of a wood with a barbed wire fence one side, banks of nettles the other and severely poached along the whole length. 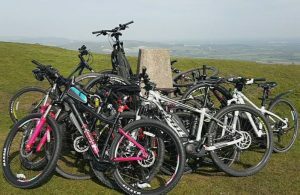 Signposting was absent and a degree of dead reckoning was needed but there were several interesting steep descents and climbs across small valleys. We then picked up a wide byway but the surface was loose clods of earth and quite muddy in places, before emerging on to an inhabited track which returned us to a road and on to Three Cups Corner and lunch in the sunny garden of the Three Cups inn. From there, a 3km gentle descent brought us to the fourth bridleway. This started well through open woodland but then we lost it and ploughed merrily around in a boggy field (which cleaned the mud off our tyres) until we returned to high ground, removed the fallen tree that had put us off the right track and resumed our route west via another short bridleway to the Cuckoo Trail. Then, joy, oh joy, a fast gentle 4 km descent to the carpark at Hellingly. 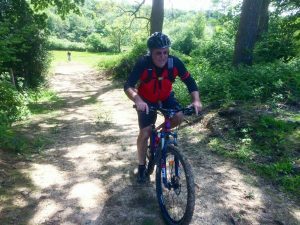 It was only 19 miles but involved some real challenges and a tremendous variety of scenery and terrain. On checking Strava, I was surprised to see that some sectors had been previously ridden, but we saw no tyre tracks . 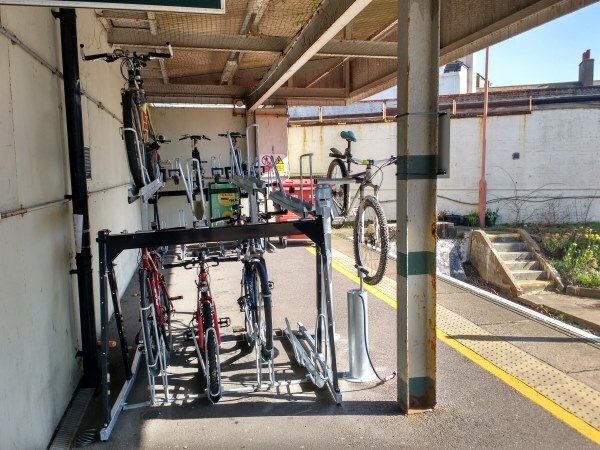 . .
Seaford train station has been given new multi-tier cycle parking, a maintenance stand equipped with tools and a floor-standing pump. 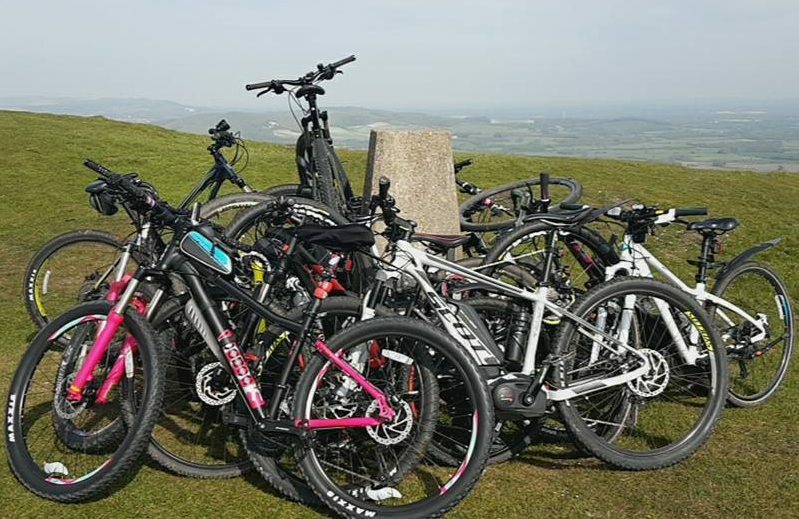 Parking for 20 bikes has been provided using Cyclepod’s Easylift+ system. Instructions how to access the top layer are posted on a blue sign just above eye level, attached to a nearby roof support (shown below). There’s a handy floor pump, which should make tyre inflation a doddle. Remember to check the walls of your tyres to find the recommended pressure. 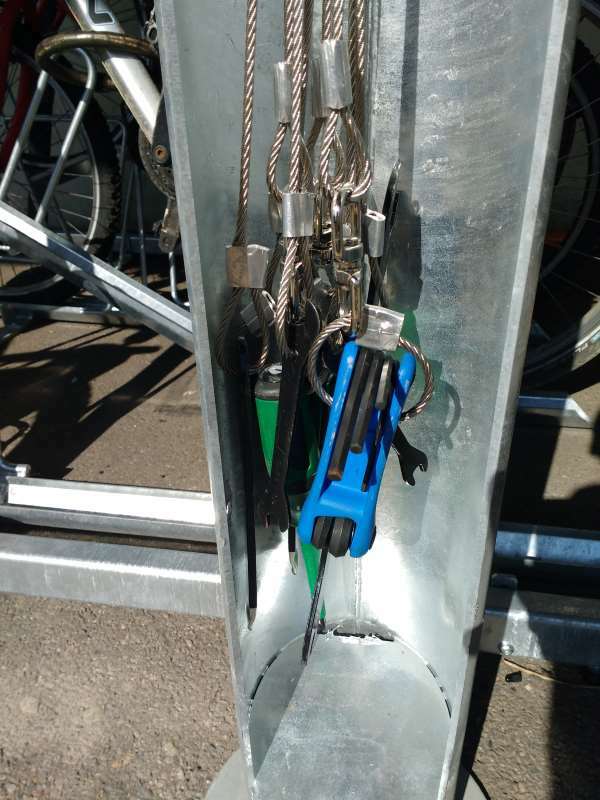 A selection of tools has also been provided, including hex keys, spanners and screwdrivers. These are all secured by a strong steel wire to prevent theft. Ice is clearly a hazard for cyclists. It can catch out even the most experienced of us and in late Winter the roads can be unexpectedly slippery. Also, the temperature a few miles inland can be 2 or 3 degrees lower than along the coast. As a ride leader the possibility of ice is one of those things I have to consider when deciding if a planned ride should go ahead or be cancelled. It’s certainly worth clicking on them and having a read. 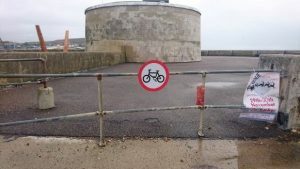 It was brought the attention of Cycle Seahaven that National Cycle Route 2 (NCN2) through Newhaven has seen some rather odd signage changes recently. Instead of following the shared path from the Ouse Estuary Trail (OET) and along to B&Q, riders are now directed to the Sainsbury’s side of the road. This rather unneccessary detour requires 8 additional road crossings (four roads with crossing islands). 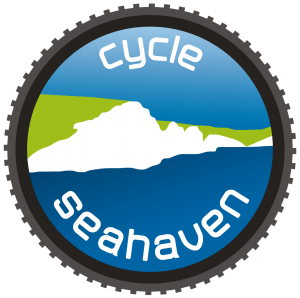 Also, when going to Seaford from Newhaven riders are directed onto the A259 rather than onto the specially built cycle-friendly crossing to join up with the OET. 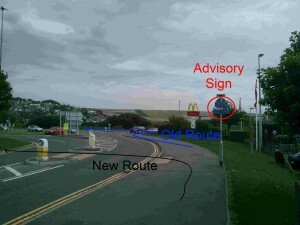 We have raised this issue with our local Sustrans representative who has forwarded it onto East Sussex County Council. For safety reasons we suggest you consider continuing to use the old route to avoid crossing in front of the very busy entrance to the supermarket/petrol sation/pub-hotel. 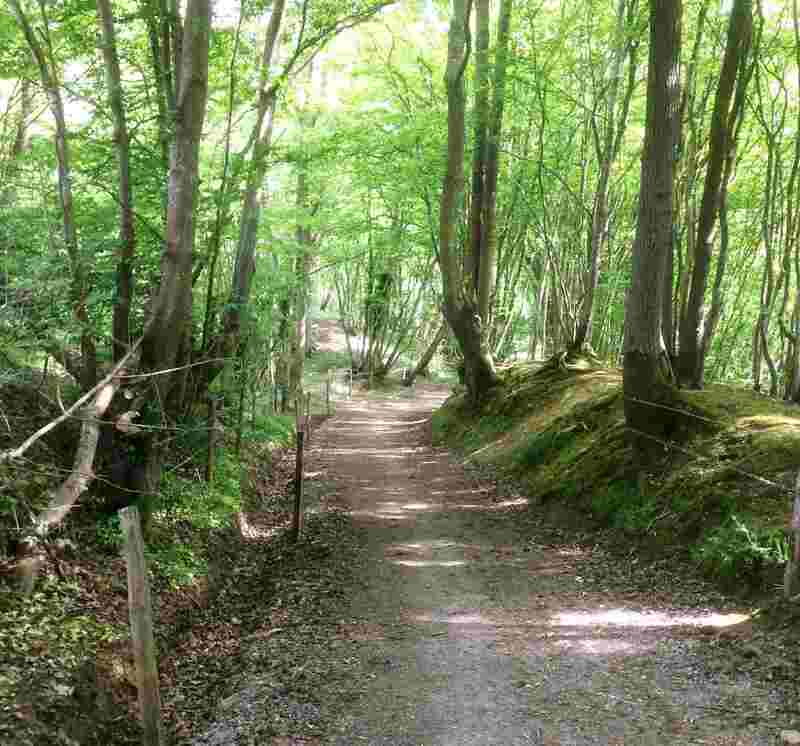 The old route is still fully signposted as a shared, cycle-friendly route. 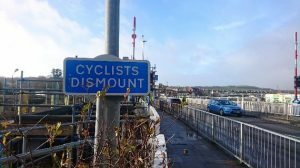 Cyclists Dismount signs are advisory. 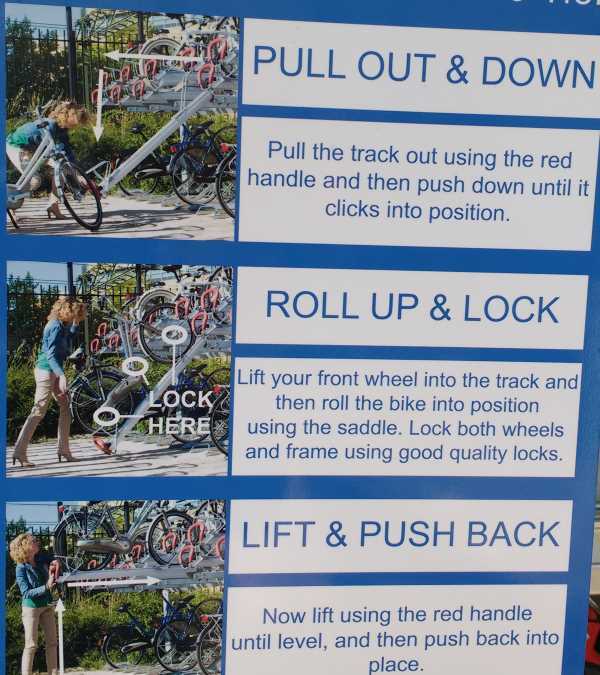 If it is safe to do so then you can continue without dismounting. 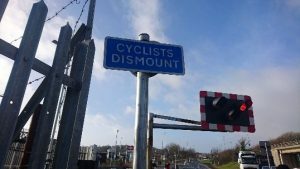 These blue signs are different to the circular white signs with a red border – No Cycling – which are obligatory and enforcable by law.